The key elements of our natural resources are waste, water, energy, transport and technology. Our impact on the environment and our obligations as a responsible corporate citizen. Develop an integrated transport plan for efficient access, parking and mobility in Waterfall City. We believe in an integrated and connected solution for our buildings and Waterfall City. With the growing complexity and potential of smart cities, we have added technological sustainability as a fourth driver to our approach. The volume of waste we produce is increasing in line with the growth of our South African portfolio and activity in our malls. The percentage of total waste recycled (not diverted to landfill) stabilised in 2018. A web-based dashboard for tracking waste management and recycling has been extended to most of our buildings, giving every property manager direct access to historical and current waste figures and recycling performance of their buildings. Our research shows that our buildings recycle at or above the industry average. Waste water generated in buildings excluding water from ablution facilities. With the recent drought experienced in South Africa, and specifically in the Western Cape, as well as a growing population in South Africa, there is increased pressure on water infrastructure and availability. We deliberately design our new buildings for water efficiency, including the use of grey water, as water constraints could inevitably lead to higher utility prices. During the year, a team focused on sustainability and infrastructure was formed to ensure learnings are shared across our South African operations and functions. During the year, we defined the ability to operate for two days without council water supply as the most important and practical target for measuring water resilience at our buildings. Live water-logging meters were installed at our most critical sites. By monitoring water consumption across our portfolio, installing back-up tanks and on-site pumps, as well as developing operational plans, we achieved our water resilience target. Water consumption reduced in line with our long-term trend (6.0% over two years) in our South African portfolio. The increase in water consumption in 2017 mainly reflects warm weather, which returned to normal levels in 2018. Water quality is annually measured against SANS 241 and World Health Organisation water quality standards at locations where we have directly owned buildings as it is an important factor in maintaining our assets. Knowing the quality of borehole and sump water is important in determining their potential use as grey water as a cost-saving initiative and as a contingent measure. We are committed to sensible renewable energy projects. When correctly designed, these projects reduce operational costs, improve the resilience of our buildings and reduce the carbon footprint of our portfolio. During the year we obtained approval from Eskom to bring the 4 755kWp Mall of Africa PV system into operation. The plant generated 1 600MWh by 30 June 2018. We constantly model, measure and plan for the increase in traffic to Waterfall as the precinct expands. How we design facilities, encourages the use of public transport, thereby reducing our carbon footprint. The impact of the Waterfall urban design, considered in all our development and infrastructure projects, will become visible as Waterfall City densifies in the next few years. The goal is to minimise internal trips by car in the City, reducing future congestion. 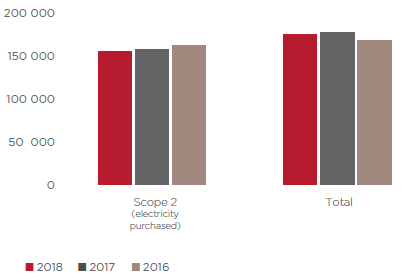 The biggest driver of our carbon footprint remains electricity consumption, which will inevitably increase as our property portfolio grows. 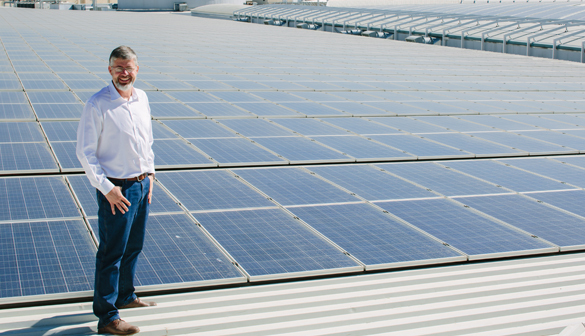 However, our carbon footprint per square metre of property in each sector is decreasing year on year, reflecting the contribution of our PV systems. In addition, we recorded a further reduction in electricity consumption with a corresponding reduction in carbon footprint (relative to the growth of our portfolio) in the past year due to the milder summer that resulted in a slight reduction in energy consumed by air-conditioners to cool buildings in our portfolio. * We calculate our carbon footprint using the equity share approach. We conducted a “Journey to Work” survey among 8 500 employees working in Waterfall to establish whether this is a central location in Gauteng. Based on 739 responses, we concluded that the macrolocation is good, and that Waterfall attracts employees from across the greater Gauteng area. We are a registered member of the Green Building Council of South Africa (GBCSA) and the United States-based Green Building Council. In future, all our developed commercial buildings will be green certified. We use green rated and certified designs as measures to ensure we build efficient buildings. Green design mitigates the risks and impact of potential carbon taxes, stricter regulations and rising utility costs. Tenants may request a building design to specific GBCSA or Leadership in Energy and Environmental Design (LEED) standards. The increase in certified green buildings relates to our three new office and mixed-use buildings, namely PwC Tower (certification in progress), Corporate Campus building 1 and Gateway West. Based on PGLA, 63.8% of our office and mixed-use portfolio is green certified and includes PwC Tower’s silver LEED certification which is currently being finalised.